I recent got the opportunity to be a part of the SpeakEasy blog network. 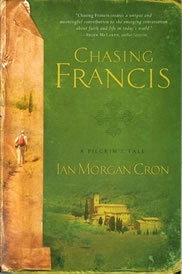 My first read for this network was Ian Morgan Cron’s Chasing Francis. I was really interested in reading a story of Saint Francis in novel form, and Cron didn’t disappoint. I quickly bought into the story of a disillusioned pastor of an evangelical church’s dark night of the soul. I wasn’t sure how Francis would figure in, but Cron makes the connection in a lively and creative way. Character development drew me into the story even further, and I am pleased to say that a wide it is done with grace and fairness. There are no one-dimensional villians here; the book is full of real humans with real human stories. I guess my one let-down comes at the end when Chase Falson, the protagonist, has returned home from his pilgrimage with Francis. Not to spoil, but he returns home a bit too much for my taste. Throughout the book I got the idea that pilgrimage wasn’t just geographical but a state of being. Yet, when push comes to shove, Falson goes back to the American mindset of the Entreprenuerial Church. One Church doesn’t fit; find some people you trust and go start another one. The only sense of accountability is to the venture capitalists (or venture spiritualists?) willing to invest in the ground floor of a startup. Francis has much to say to all of us followers of Jesus, and Cron opens many doors for connection, for learning, for insight into our own times and beling faithful in them. I know Francis lived before the Reformation, before the splintering of denominationalism that that era in history began and we are still playing out. But what can, or what would, Francis say to us about faithfulness and accountability to structures of “Church” that are above, around us? Don’t get me wrong; I appreciate Chasing Francis deeply, and will likely join Rowan Williams in reading it a second time. What Can/Can’t We Talk about?